In mid-February 2000, BP Amoco, on behalf of the Shah Daniz participants, gave outline plans for the potential export of Azerbaijani gas to Turkey from the Shah Daniz field in the Caspian Sea. 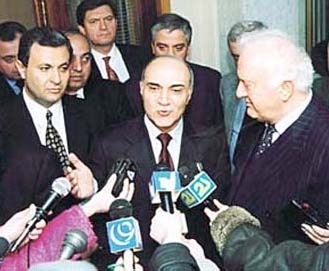 Left: Rashid Javanshir (left), President of Shah Daniz, Inam and Alov PSAs, with Valeh Alasgarov (center) of SOCAR visited Georgia in March 2000 to discuss gas exports from Azerbaijan with Georgian President Shevardnadze (right) on March 13, 2000. This followed the successful drilling of the second Shah Daniz well (SDX-2), confirming the existence of a significant gas condensate discovery and which underpins the first stage of a development project. Andy Hopwood, BP Amoco's Azerbaijan Exploration Business Unit Leader, said: "The gas memorandum signed between the governments of Azerbaijan, Turkey and Georgia in Istanbul in November provided the framework for the export of gas from Azerbaijan. Taken together with the excellent Shah Daniz drilling results, it provides us with the confidence to respond positively to the demands of the market. "We are presently planning a staged development with a first stage producing 5 billion cubic meters (bcm) a year, subsequently rising to possibly 16 bcm a year. There is confidence that the results of the two wells already drilled, combined with those of a third well to be drilled later this year, should enable us to prove first stage resources of 150 billion cubic meters (5tcf) of gas and 20 million tons (150mmbbls) of liquids. The Shah Daniz partners will be working with governments to develop the framework agreed in Istanbul with the objective of delivering first gas to market in the winter of 2002-2003." Hopwood added: "Azerbaijan - and Shah Daniz in particular - is a competitive source of supply for Turkey given its proximity to the market, the availability of existing infrastructure, and low development costs. The establishment of a competitive gas export route from Azerbaijan will build a bridgehead to the Turkish market and affirm Azerbaijan as an important regional producer of gas, as well as oil." 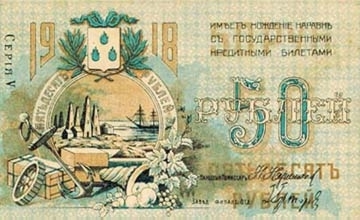 Left: A 50-ruble note of 1918 published in Russian. Note that oil was the center of commercial activity. At the turn of the 19th century, Azerbaijan produced more than 50 percent of the world's supply of oil. Courtesy: Yagub Karimov. The first stage concept is based on simple offshore structures in the shallow water area in the north and east of the field. Transportation to the Turkish border will be through a combination of new and existing infrastructure. Detailed engineering is expected to start shortly. The SDX-2 appraisal well was drilled to a depth of 5,892 meters, penetrating three main horizons. The well is now on a comprehensive testing program and the first of two planned flow tests is underway. SDX-2 was drilled six kilometers to the south of SDX-1, the original discovery in July 1999. A third well (SDX-3) will be drilled later this year to further delineate the field, with possibly three more appraisal wells to follow, and the potential for further upgrading of reserves. The field lies in water depths between 50 meters and 600 meters, some 70 kilometers southeast of Baku. On March 4, 2000, BP Amoco Azerbaijan leadership (David Woodward and Andy Hopwood) met with President Aliyev to convey good news about the successful drilling of the second Shah Daniz well (SDX-2), confirming the existence of a significant gas condensate discovery. They advised President Aliyev of the company's plans for the potential export of Azerbaijan gas to Turkey from the Shah Daniz field in the Caspian Sea. On March 13, 2000, an Azerbaijani delegation led by Valeh Alasgarov, Chief of SOCAR's Foreign Investments Division, and Rashid Javanshir, President of Shah Daniz, Inam and Alov PSAs, visited Georgia to make presentations on plans for the potential gas export from Azerbaijan. Following the meeting, the President of Georgia made the following statement: "Georgia's transit potential opens up new major prospects for the development of fraternal relations between the two countries." The Shah Daniz license partners are: BP Amoco (operator - UK), 25.5 percent; Statoil Azerbaijan A.S. (Norway), 25.5 percent; SOCAR Commercial Affiliate (Azerbaijan), 10 percent; Elf Petroleum Azerbaijan B.V. (France), 10 percent; LukAgip N.V. (Russia / Italy), 10 percent; Oil Industries Engineering and Construction (Iran), 10 percent; and Turkish Petroleum Overseas Company Limited (Turkey), 9 percent. The offshore lifting and installation of the 250-ton water injection module and 50-ton de-aerator on the Chirag-1 platform was successfully completed in February 2000. The operation was carried out using SOCAR's derrick barge Azerbaijan. The equipment will be used to inject water to safeguard the productive life of the reservoir by maintaining the field pressure. The water injection system installation will also enable extension of the plateau production period. The Chirag water injection system is designed to inject up to 220,000 barrels per day. 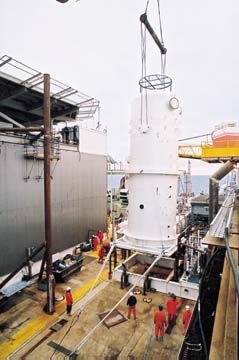 Left: Deaerator vessel installed on Chirag Platform on February 6, 2000. BP Amoco is the operator for the project. BP Amoco commenced drilling the sixth appraisal well in the Gunashli, Chirag, Azeri contract area (GCA-6) on March 21, 2000. The well is being drilled by the semi-submersible drilling rig Dada Gorgud. The well is designed to appraise the far eastern part of the Azeri Field. For the first time, the combined Azerbaijan Business Units of BP Amoco achieved 2 million man hours worked without a single day being lost through injury. As part of this outstanding safety record, the Sangachal Terminal has also achieved 1,000,000 manhours (884 days) without a day away from work case. To celebrate the 80th anniversary of Baku State University (BSU), BP Amoco presented its library more than 300 copies of eight books published through its sponsorship. The gifts included the first three volumes of selected world literature classics translated into Azeri. The works represent the countries of the companies involved in contracts that BP Amoco is implementing. One of the most valuable gifts to the library was a fundamental research work conducted by Elmaddin Alibeyzade, Doctor of Philology. The research focuses on "Kitabi-Dada Gorgud", the Azerbaijani people's most ancient epic, whose 1300th anniversary will be celebrated during the Turkic-speaking Nations' Summit in Baku in early April. Other books included "Ecological Conception of the Caspian Sea" (Azeri-English), "Ecological and Geographical Atlas of the Azerbaijan Republic" (Azeri-Russian), "Wonderful Wildlife of the Caspian Sea" (Russian-English), prepared by BP Amoco, and "Archeology of Azerbaijan," written by the late professor Rashid Goyushov for English-speaking readers. BP Amoco has also helped upgrade the university library and has provided it with new computer equipment, furniture and appliances. Guivami Rahimli, BP Amoco's Community Affairs Officer, was Project Manager for the university-related events. Baku State celebrated its 80th anniversary on February 12, 2000. BP Amoco was invited to honor this major event together with representatives of Azerbaijan's senior government and state officials and the public. A new-look MediClub clinic, refurbished and re-equipped by BP Amoco and MediClub, opened in Ganja in early March 2000. BP Amoco and MediClub provided funds for the refurbishment of the clinic to improve patient care. The facility will provide a vital service to the community as well as to BP Amoco's employees along the Western Route Export Pipeline. Photo: Medi-Club, a newly refurbished and re-equipped clinic by BP Amoco opened in March 2000 in Ganja. 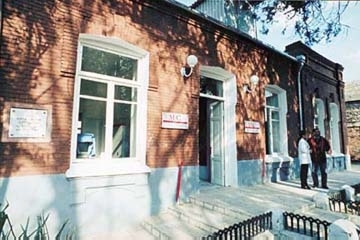 The clinic is housed in the same building used for Ganja's first medical surgery, set up in 1904 by Khudadat Rafibeyov, the first Minister of Health of the Azerbaijan Democratic Republic, and the Governor of Ganja. In addition to financing the renovation, BP Amoco provided medical equipment and supplies, including an X-ray machine, artificial ventilator and special hospital beds. The company has also provided the clinic with an ambulance and an electricity generator to ensure the clinic has uninterrupted power 24 hours a day, independent of the Ganja energy supply. At a ceremony to mark the opening of the improved facilities it was noted that it is the first private clinic in Ganja. The clinic will now offer hospital outpatient treatment and an emergency medical service. The clinic will also carry out surgery and laboratory analyses. Doctors at the clinic are fluent in English, Azeri and Russian, and will be supported in their work by consultants from Baku and Ganja. Left: BP Amoco has created its own tradition of organizing a Novruz Party for needy children each Spring. The party is held in the Nizami Cinema. BP Amoco sponsored the performance of Verdi's "Requiem" at Baku Music Academy in February 2000 to commemorate victims of the Khojali massacre as well as all those who sacrificed their lives for Azerbaijan's independence. This year, BP Amoco hosted several major Novruz celebrations for orphans, refugee children and kids from needy families. Nearly 1,500 children between the ages of 5 and 15 were treated to a colorful spring concert that included the antics of Kechal and Kosa - heroes of all Novruz festivities. The children also received gifts, such as traditional Novruz cookies. Many of the children came to Baku's Nizami Cinema from orphanages and institutions for the mentally and physically handicapped via BP Amoco-organized buses, some traveling outside their places of refuge for the first time in their lives. From Azerbaijan International (8.1) Spring 2000. © Azerbaijan International 2000. All rights reserved.